The Government Accountability Office says many federal government programs contain duplicative and overlapping projects and have not made progress for program efficiencies. The report released Tuesday cites several agency practices which are areas of interest for the White House‘s plan to consolidate agencies and functions. Comptroller General Gene Dodaro said in the report introduction that GAO identified 51 areas needing greater efficiencies and 32 programs that were duplicative. 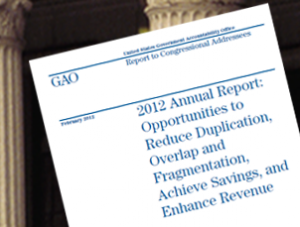 GAO said agencies addressed five percent of the problems GAO identified in its March 2011 report on duplicative programs. The GAO suggested the Defense Department improve its $37.5 billion unmanned aircraft systems project and consolidate the Pentagon’s duplicative information technology processes with the Energy Department. GAO also recommended the Pentagon improve cooperation with the Department of Veterans Affairs to lessen conflicting medical services between the departments. GAO suggested agencies consolidate economic development programs and eliminate overlap in science, technology engineering and math programs. Auditors recommended the Department of Homeland Security modify its approach to assessing cyber facilities and said there needs to be a coordinated framework among federal cyber workers.